Fly out 25th April. Arrived about 2300 in shared taxi with David Littlemore and his daughter Sam to lovely welcome from Phil and Fi in Gouvia Marina. 26th April. Colder and less sunny than we had hoped and the sail down to Mourtos was into a headwind and occasional rain. Enjoying a beer and nibbles at Bamboo Place. 27th April. Arrived in Preveza after leaving Mourtos at 7am. Our lovely boat seemed in pretty good condition. 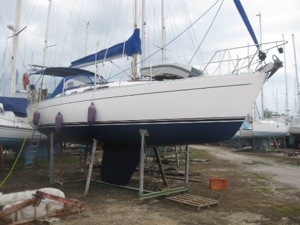 New service batteries had been installed and our repaired main sail and newly galvanised anchor chain had been returned. 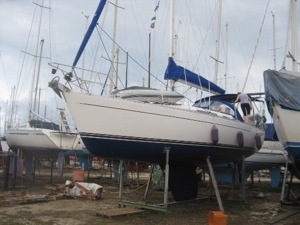 We’ve a couple of days to clean her, anti foul her and put the sails back. 28th April. Slept on Lover. Woken by Sue scrambling over me to shut the hatches because it had started to rain. What rain! And thunder and lightening! The ground was flooded to a depth of 40 mm all the way to the toilet block and no sunshine to heat the shower water. Caught the minibus into town and filled both rucksacks with provisions. 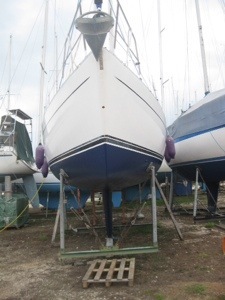 Put up genoa before lunch and had main half installed when the rain started again. Dropped it just before a huge gust. Sue inside getting everything shipshape and finding lots of damp stuff as we hadn’t shut the hatches properly or quickly enough. 29th. Sue polishing the white bits. I’ve just scrubbed the blue bits ready for anti foul tomorrow. Re galvanised chain marked in 10 m lengths, installed and attached to the anchor. We’re getting there but both completely knackered! 30th Anti fouled and tidied up. 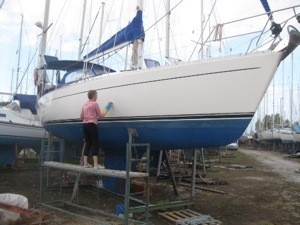 Putting winter covers, sail bags, paint brushes away in their lockers. Doesn’t sound much but we must have remade our bed, removing the three cushions that we sleep on and the three huge plywood covers over the lockers at least five times so far. Had a massive storm last night but dry all day. Busy up to launch and nervous but all went to plan. After the launch we motored into a headwind to Lefkas and moored on the town quay for two nights, meeting up with our good friends Dave and Viola and his sister, Mary. Meal in taverna first night then on Lover. Set sail for Vathi Saturday in a force 5 only for the spring shackle on the genoa to come unclipped. So we had to furl it and motor sail. Moored stern to next to Pernol, Dave’s boat and Panacea, Phil & Fi’s boat in this delightful, quiet harbour. Walked admiring the wonderful spring flowers to Katomeri and feasted off the calamari and beet root we had purchased in Lefkas. Today we sailed across to Nidri and moored bow to on the town quay. The anchor chain I had laboriously measured and marked is not our chain and we have to remove it and then measure and mark the correct chain. If it’s not one thing… Walked into Vleho, met Viola, picked up our new DVD player and had a lift home. Later they came and we swapped the chains over and received 5l of red wine from Patras. We were taken with a young Greek, Andrea, who is to live in D & V’s caravan and work on their land in Fterno. All the neighbours wanted to meet and greet the three of them and it was ages before we at last sat down in the taverna where they serve the best liver ever. 5th May Walked to chandlers and bought a new control switch for the stern anchor before calling in on IBA and putting Lover back on sale. Feeling lazy so decided to stay put. 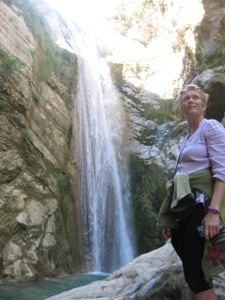 In the afternoon we walked to the waterfall which was lovely. 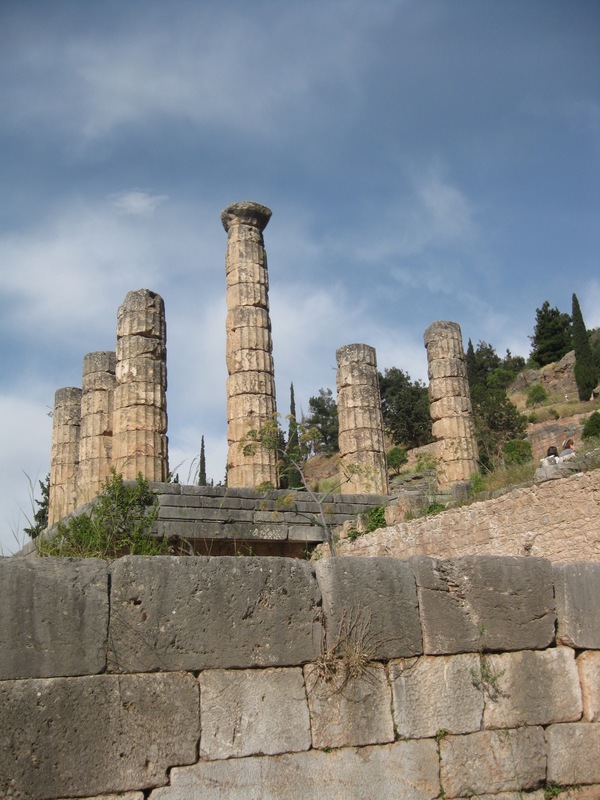 Next day we set off at about 11 to sail to Kalamos where we were to meet up with our four friends. We had light winds to start with but eventually decided to motor. The plans were then changed as none of us fancied motoring all that way and we met up in Atheni. We had our first swim of the season and were surprised how warm the water was. We all ate together on Panacea and Phil played us a selection of music with great enthusiasm. Dave, Viola and Sue braved the waters again and four of us went for a walk. It has warmed up considerably. Just before lunch we resumed our passage to Kalamos having a gentle sail, three boats in close contact, across to Kastos. We started motoring but then the wind picked up and we had a great sail the rest of the way. We moored stern to and met up for a drink at the ice team cafe before dining on Pernol. 8th Our anchor over neighbours chain. Soon sorted. Bridge on Pernol then goodbyes as it’s the beginning of our new adventure. We set off in convoy with Panacea for the Gulf of Patras where we intend to spend the next two weeks, stopping en route at a desolate place on the mainland. Had a good sail here doing the 13 miles in 3 hours but at the wind picked up and as I write this is still howling. 9th Off fairly early as a long sail. Had to motor for over two hours but sailed most go the 25 miles. Now moored in Messalonghi marina next to Panacea who are joining us for dinner – Sue’s cabbage and peanuts in cheese sauce. Overnighted here and then walked into town where we bought loads of fresh veg and fruit very cheaply from the market. 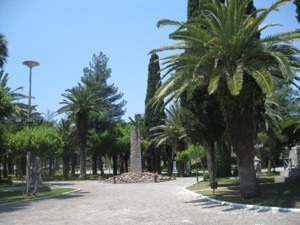 After a coffee and chat to James and Jo on FaceTime we visited the heroes garden where Byron’s heart and many Greeks slaughtered in 1825 are buried. A beautiful spiritual place with unusual statues. Set off at 7 next morning in hazy still conditions and motored for 20 miles in convoy. 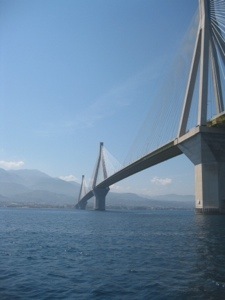 Went under the magical bridge connecting mainland Greece to the Peloponnese and then the wind got up. We dropped the main, hoisted the genoa and soon were doing 6 knots. A dolphin accompanied us for the rest of the 30+ mile journey going between the two boats. The wind became very strong – 35 knots – and we reduced the sail but not the speed. Went alongside the quay in Trizoma, a lovely little island and fed Phil & Fi Alisa’s mushroom & bean risotto. Gales forecast so decided to stay. We walked round most of the island through fields and olive groves carpeted in flowers. 16th We had a great sail to Galaxidi with following winds gusting up to 40 knots. It’s a lovely place and we moored stern-to next to Panacea. The gales have persisted and we’ve been unable to leave for the past four days. The day after we arrived we went in a minibus with couples from three other boats to Delphi for the day. < The setting was amazing but apart from the amphitheatre and the stadium there was very little standing. On the way back we stopped for lunch, all 8 of us. That evening and the following two we all met up for drinks on one or other of the larger boats. Yesterday we had a bit of a drama when a French boat squeezed into a space that was really too small. We watched them from the other side of the bay as they dropped their anchor too far downwind so hurried back. Phil ran past us on the way to the port police as one of them had climbed on Lover and loosened the mooring ropes. They duly arrived and said I could go back and charge them but I thought life’s too short. Today they re moored somewhere else but we’ve spent quite a bit of the day helping people moor up in strong cross winds. Sunday Another 7 am start. Long, long day – 10 hours 47.5 miles, nearly all under sail tacking into a headwind all the way to Missalonghi. Fi offered to cook and Sylvia emailed to say she and Dave would be here tomorrow so that would be the end of the exploring the Bay of Corinth in convoy as Fi and Phil need to continue to Lefkas. Monday Busy morning getting Lover ready for our guests. Refuelled, filled the water, did the washing, re provisioned, etc. Sue went off to meet them after lunch and returned empty handed at tea time. The bus had gone past the stop and they had to catch another one back. For some reason they were so fed up by they decided to continue back. We were upset. Tuesday Set off at 8. Motored for nearly four hours with no wind then had a six hour sail to Kastos. We arrived very tired,having done forty miles, in a force five/six with lively seas and anchored with a line ashore kindly assisted by our neighbour as we were struggling. Spent a relaxing day in Kastos then set off for Spartakhori to meet Dave and Sylvia, sailed a bit but mainly motored. Very hot there so we decided to go to Big Anchor Bay where, to our delight we saw Pernol. A very nice afternoon, evening, swimming, playing bridge and all seven of us eating together. Next day after a walk we motored to Vathi to get Internet access and provisions then motored to Kapali, just the next bay where we met Dave and Viola and did the same. On Saturday we came across to Nidri, showered and were taken out to a meal by Dave and Sylvia. Wed 28th May Les, Alex & Beth arrived next lunchtime. I sorted the laundry and bought gas then we met up at their hotel. We took them over in two trips in the tender to Lover and they were so settled they stayed for a meal aboard. Next morning we bought provisions and went alongside the quay to make it easy for Alex to get on board. 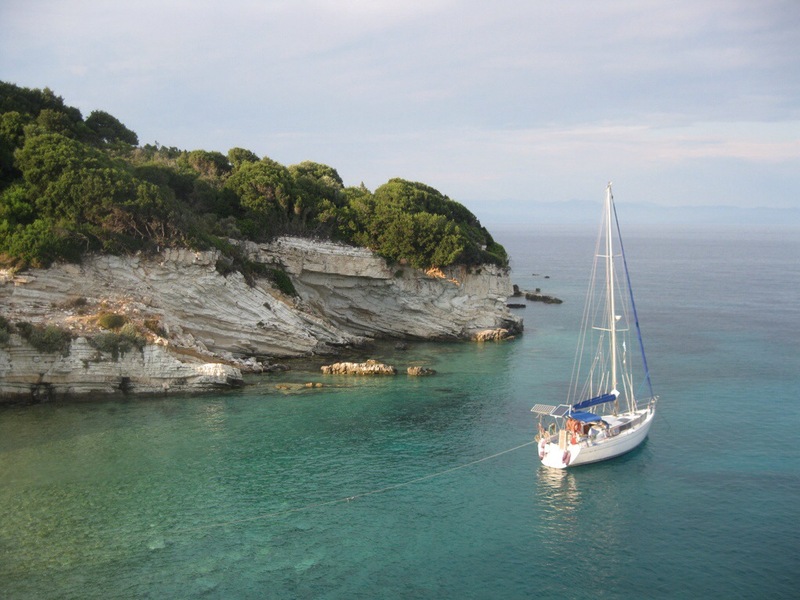 We took them on a short trip to Big Anchor Bay on Meganissi as they were unsure how they would get on. Once there we all swam and decided to continue with our most ambitious plan for them. 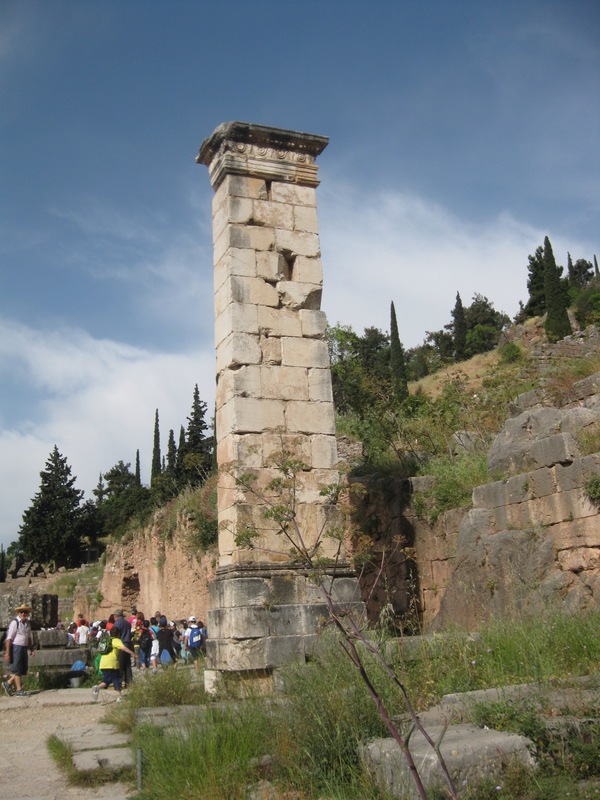 We sailed to Polis on Ithica, stopping off at Arkudi, an uninhibited island, for lunch. The wind picked up to 25 knots and we took in big reefs, still managing 6 knots but having to do big tacks to get there. We arrived, shattered at 1800, and Viola was there in an inflatable canoe to take a line ashore for us. After a refreshing swim we went up the steep hill to the village, Alex in a taxi, and had a pleasant meal in a garden restaurant. 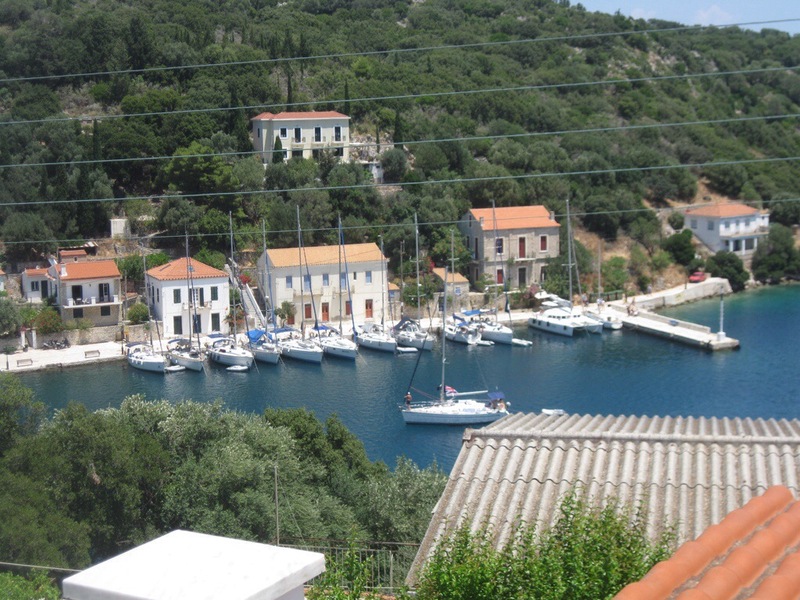 Today we motored the short hop to Fiskado on Cephalonia where we found an ideal spot on the quay. Showed some potential buyers over Lover. We had a pleasant meal at a quayside taverna and then played cards. Bad weather was forecast so we left quite early before any wind. We watched as clouds amassed over the mountains and soon a storm hit us, thunder, lightening and heavy rain. 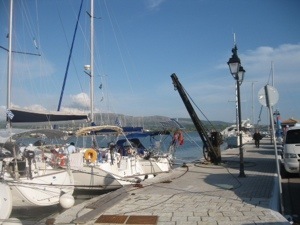 We moored bow to on the town quay in Sivota, paid Simon and fixed the autopilot. Next day we spent the morning in Sivota Bakery Cafe, the Family Restaurant and showing people two lots of people over Lover. Everyone so far has loved her, so that’s a start! 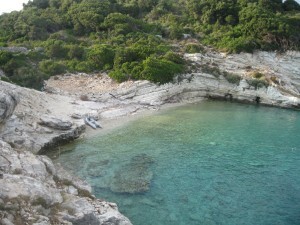 In the afternoon we sailed to our bay on Meganissi, swam and played cards. Saturday Spent the morning lazing, reading and swimming and set off for Nidri after lunch, returning our three guests in plenty of time to catch their plane tomorrow. We had done more in the week than we could have hoped. Had a pleasant last meal then discovered we had to re anchor Lover in the pitch black. Next morning saw them off on the coach and after chatting to family on Skype set off for Sivota where we moored next to David and Viola with the promise of a game of bridge. Stayed for two more days, the first to catch up on rest and the second to avoid sailing in a thunderstorm with high winds and heavy rain. Played lots of bridge. 5th June One year ago we took possession of Lover. Today we’re in Sami awaiting our next guests who I hardly know. We had a great sail to Polis yesterday but a frustrating time anchoring taking ages to get lines ashore and it was very windy so I kept waking up and checking. Today we sailed down. 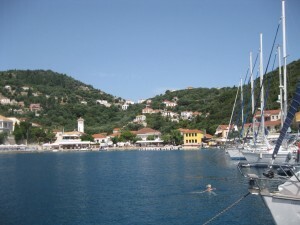 9th June A great sail across to a bay at the extreme south of Ithica with beautiful clear water. Unfortunately there were stinging jellyfish to contend with. Left about lunchtime after inspecting some buildings which included a lime kiln and moored in Polis. We had a meal to celebrate Clare’s birthday. 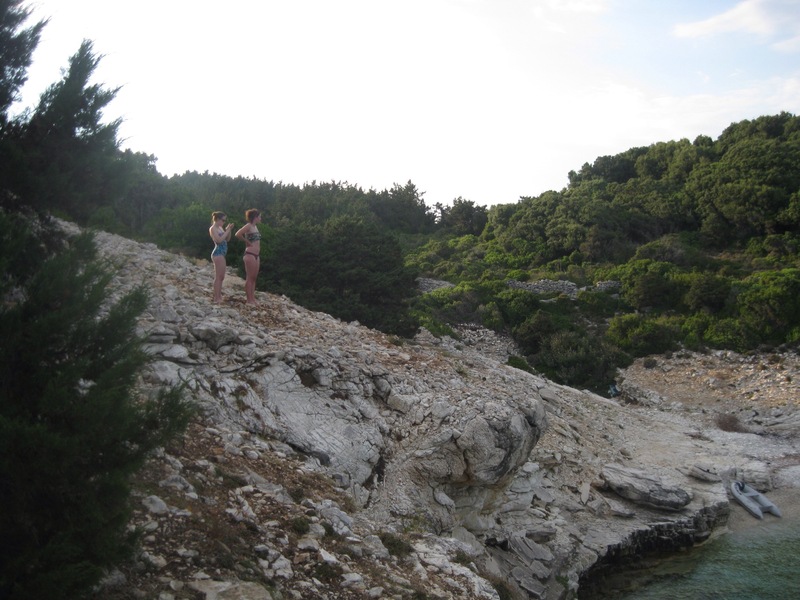 In the morning we had a swim round the small island then set off with new provisions provided by our guests. 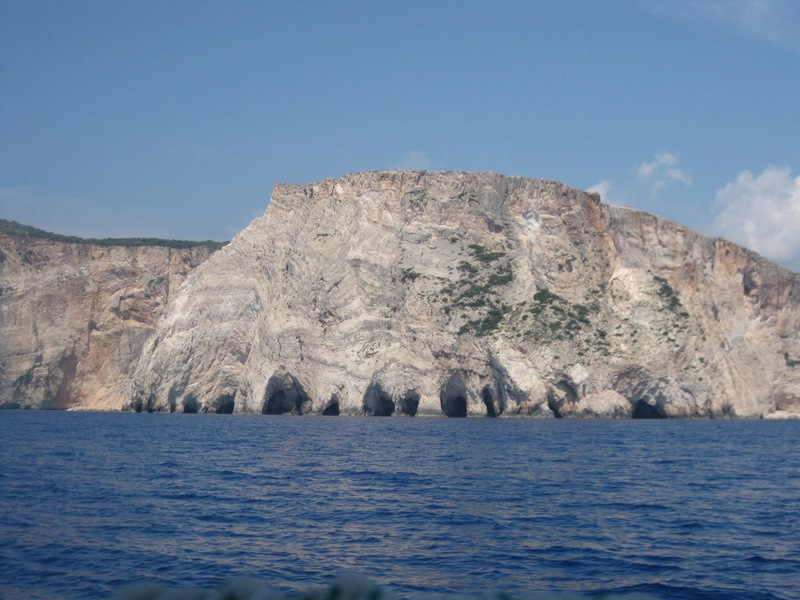 As we rounded the southern tip of Kephalonia the wind got up. We anchored in a large shallow bay dotted with rocks and had a lumpy if secure night. In the morning we decided to head for Argostoli and sailed most of the way until the huge bay into which we motored into strong headwinds and lumpy seas at less than 3 knots for 1 1/2 hours. Bows to on the quay. Accosted by the port police who charged us €17.50 for 2 nights. After dinner we strolled into the square and had a plate of ice creams between us and coffees. Next day we were treated to lunch and did little but recover from the previous days hard sail but a swim from the beach. 11th Motored up the bay and anchored in shallow water at the top without a single other boat in sight. Lazed, read, swam and did some yoga. Fish uninterested in the slightly off prawn on my hook. Motored back to Argostoli and were treated to a full on meal in the square by our guests who left us watching the children playing and cycling around. I love the place so we’ve stayed another day, just recovering from entertaining, stocking up and amusing ourselves by walking and swimming. 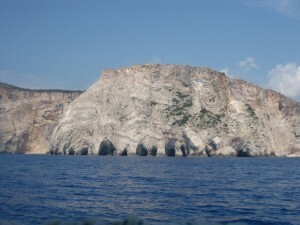 14th Long day yesterday from Agostoli to Keri at the southern tip of Zakinthos, mainly under engine, 40 miles, 10 hours. This is where the turtle beaches are so there are lots of trip boats to view them. Spent the next day at Keri which is pretty but commercialised. Then set off back to Poros, another long sail, 35 miles but this time we sailed most of the way, mainly at 3 knots but with an exiting spell where we raced along at 6.5. – 7 knots. 17th Today we pottered up to Sami with a light tail wind and a lady remarked on our Porthmadog pennant – she’s from Mochras! 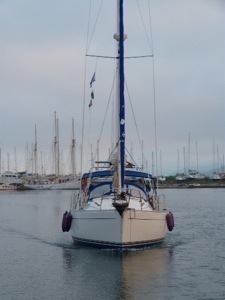 We also met a chap who had sailed his yacht from Anglesey to Greece with a professional crew in 5 1/2 weeks. As we were considering the possibility of sailing Lover back we were interested in what he had to tell us. Next day some very pleasant S Africans moored next to us and I enjoyed their company very much. Philip’s way of saying my name reminded me very much of my Granny. On Thursday we set off to meet Dave and Viola on Meganissi and the weather threw everything at us, flat calm to start with then squalls of 30 knots on the nose, rain and finally a great wind that took us at good speed almost all the way from the top of the channel. We had a lovely welcome from Pernol, played bridge and shared food. Dave helped me do a better repair on the autopilot. The night was stormy and strong winds promised so we motored to Sivota early and spent two nights there. We had a trip in their car to Lefkas town and stopped off at Lidl. On Saturday we set off for Fiskado and had a great sail. Mike and Jo came for a meal aboard and treated us to a coffee. Loud music played till 3am and kept us awake. We had lunch and a shower on Sunday in their apartment and walked to Foki for a meal before coffee and cards. We spent the next day in Fiscado. On Tuesday we set off for Polis and spent the rest of the day and the next morning there but Mike said they weren’t happy so we sailed back, dropping them off as there was no decent mooring and anyway we wanted a decent sail. 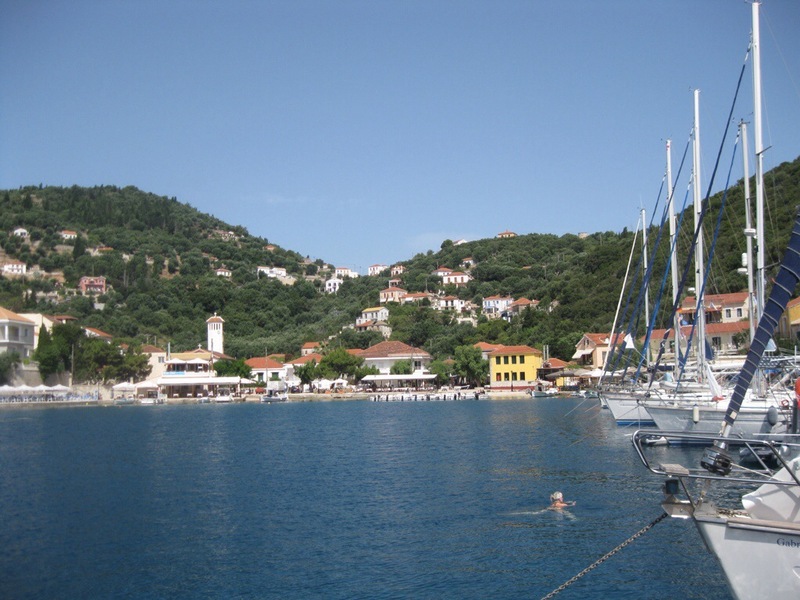 We set off for Sivota but Dave and Viola were in K Bay so we changed course and met there. Ray, Philip, Reneee and Judy were also there which was a nice surprise. We ate on Pernol. On Thursday the eight of us walked to Spartakhori for a coffee and to get provisions and in the evening the 4 of us and Tony, who had joined Pernol came for dinner. On Friday we sailed across to Polis and met up with Pernol. We put a long line ashore there which is not easy with just two of you and just as we were tightening up the anchor windlass went ping and a bit shot up and into the sea. Then a strong cross wind pushed us into a moored boat. Viola and Tony responded to my call for assistance and we slipped off the stern rope, pulled in some chain and then Viola reattached the stern rope to another rock. We all ate together again but had a sleepless night as we weren’t convinced the anchor was holding. When we pulled it up next morning, using our sick windlass, there was a huge clump of weed on the anchor confirming our suspicions. No harm done we sailed to Sami. We had dinner there with live music, mandolin, guitar and voices playing traditional Greek songs. Lovely. Sunday set off at 8 after a swim on a glassy sea and motored round the bottom of Ithica and all the way up the east coast to Kioni where Jo and Mike were waiting on the quay for us. Had lunch in their magnificent apartment and watched as the quay filled up with yachts. Spent another day here in this lovely harbour then took them to Vathi where we were treated to a lovely meal of grilled pork with peppers. 2nd July Motored back to Kioni and watched the jostling for mooring spaces with amusement, pleased we got back early. Had a meal at Mike and Jo’s apartment and played a 13 session of blob (card game). 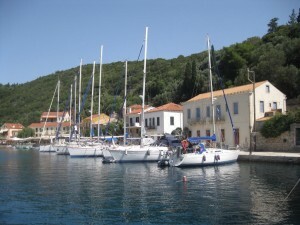 Winds of 5-6 forecast so we set off early for Sivota in variable conditions. Had 2 lots of washing done and made contact with our mechanic who is to look at our winch today. With a printout of the manual I was able to strip it and found a bolt had sheared but we don’t have a replacement. 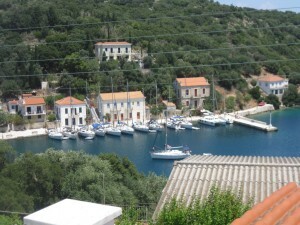 6th July Spent a few days in Sivota. Winch fixed. Swims from the beach. Dinner with Dave and Viola a couple of times, once on Lover and once in their village in the hills where we were entertained by Andreas’ guitar. Watched the tennis finals and planned our next month’s sailing. On Monday we sailed to big anchor bay and met up with Pernol and had dinner with them and Mary and Sam and Mike and Ann. On Tuesday we went to Nidri to have the cooker fixed, get cash and provisions. Again dinner on Pernol, chicken and mushrooms. Wednesday was a strange day. A walk to the cafe, a game of bridge then a trip to Nidri to show prospective purchasers over Lover. They joined us for a sail to Lefkas and seemed to like it. After a short zzzz we went to the marina for a shower, met up with Linda and Martin for a drink and finally ate at 2200, leftover potatoes and giant beans. 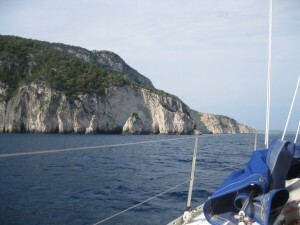 On Thursday we caught the 7 bridge opening and motored for 8 hours to Laka on Paxos. The autopilot seized in the canal and Sue did well to avoid colliding with a dredger. I disconnected it and on further inspection decided it needed a replacement part. Woken in the night with surprise rain drumming on the cabin and splashing my face. Up like a shot to close all the hatches etc. 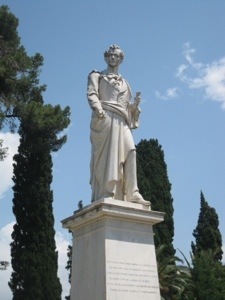 12th July Sailed to Petriti, at the south of Corfu, in winds of around 18 knots all the way, averaging over 5 knots. I enjoyed the exhilaration of the first couple of hours but found the next three wearing. We were greeted like old friends at Stavros’ Taverna and treated to a session of Greek dancing and free ouzos. 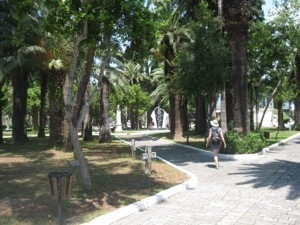 Next day we had a lazy morning and set off for Corfu town for our rendezvous with Carla on a glassy sea. A period of wind allowed us to switch off the engine but it would not start in the next period of calm. We both searched frantically for loose wires or blown fuses but gave up and phoned Klaus of Save our Souls who had helped us last year. After some frustrating calms the wind picked up enough to take us to our intended destination and we dropped anchor. Klaus took just 1 minute to find the broken connection on the alternator, a place neither of us had thought of looking and we re anchored in a more convenient spot. Carla arrived on time. It was lovely to see her. Sunday we went shopping and then met Jo and Kane at the airport. After a swim and lunch we set sail, having a great sail to Mourtos where we forced our way between two reluctant owners onto the town quay so they could watch the World Cup final. The smell in the morning was awful so we set off for Paxos before the wind had got up glad to leave. Over the past couple of days we have been negotiating the sale of Lover and today received the deposit. We anchored in Lakka but made a pigs ear of it. Jo cooked us a meal on board and then we played cards. We were woken in the night by a helpful man a passing tender because we were dangerously close to a neighbouring boat. Extra chain seemed to fix the problem but I kept getting up to check. Also it started raining so we had to close hatches and take the cushions in. Not a great nights sleep! Stayed in Lakka for a second day chilling out. We all went out for a fabulous meal there in the evening and the young ones stayed on drinking until 3 am. 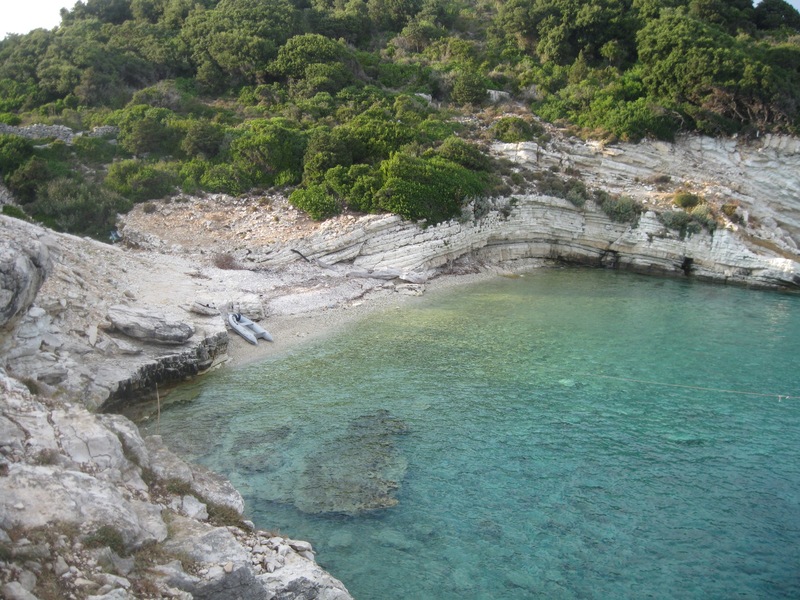 On Wednesday we motored to AntiPaxos and found a little bay which we had to ourselves overnight after the day boats had left. It was beautiful. Thursday was time to go back north and we had a long trip to Petriti. It was very hot. We had a meal at Stavros Taverna and left the youngsters in a bar. Friday. Ashore with our washing. Maria from the taverna offered to do it for us. Kane made a number of trips with containers to top up our water. Coffee etc. ashore then lunch before setting off for Corfu. Walked into town and had a lovely meal before saying goodbye to Jo and Kane. Ann and John arrived and we set off to Kalarmi after lunch. Ate at Gerald Durrel’s old house. Next morning we sailed to Ataki Bay. Our anchor dragged and we had to cut the line ashore which was pulling us shorewards and re anchor. We had the bay to ourselves and went for a walk. Then the trip boats arrived and it was so unpleasant we decided to move. We tacked in a strong southerly wind to Sagiada, leaving a huge storm behind. Several waterspouts were a spectacle but we didn’t want them to get too close! Had a lovely meal of prawns then walked in the cool to the supermarket up the hill. Storms woke us up in the night. Wednesday – Motored the short distance to Iguminitsa Creek which we last visited with Si and Elaine 4 years ago. Walked over to the beach for a swim and a beer. Sailed in very light to no winds most of the way to Petriti until suddenly it blew 20 knots. Meal at Stavros. After a shower and hair wash at Stomatis we sailed most of the way back to Corfu. We walked into town where Sue bought a lovely dress and we had a meal with Ann and David. The town was buzzing and we watched an open air dance show, killing time because their flight was in the early hours. I took them ashore after midnight. 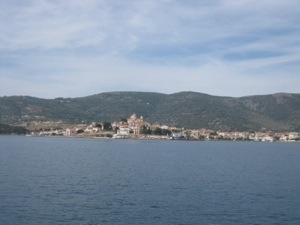 We sailed the 25 miles to Lakka next day, only motoring for an hour. It was our wedding anniversary but we were too tired to go ashore so we cooked an easy meal and watched a film. Monday – a lazy day recovering and our anniversary meal at Alexandros – the best taverna we’ve found this year. On Tuesday we had a slow sail across to Two Rock Bay which we had all to ourselves the first night – a first. Our final sail was mostly under engine, the 20 miles south to Preveza. Now lifted out so the end of our adventures. Mixed feelings.